Inside Sales Executives recommend solutions and enhance client satisfaction and service revenue to the sales department. The highlighting duties that forms part of the job description of these executives include – participating in weekly sales meetings, completing recurrent training programs, learning sales related features, maintaining and updating notes, making calls to present leads, complying with company’s policies, acquiring team sales objectives, cold calling to develop business, and resolving all issues pertaining to customer queries. 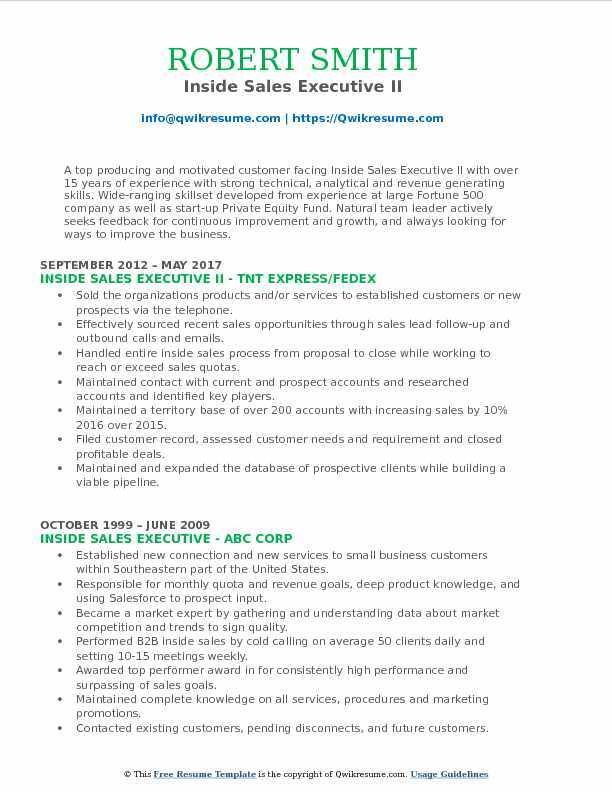 The skills that are considered crucial and listed in the Inside Sales Executive Resume are – customer-service skills, communication skills, flexibility, and persistence. When it comes to education, the inside sales executive should have a strong Sales background with a sufficient level of related experience. Thorough knowledge of the product that they are selling and Proficiency in the related software is paramount for this role. 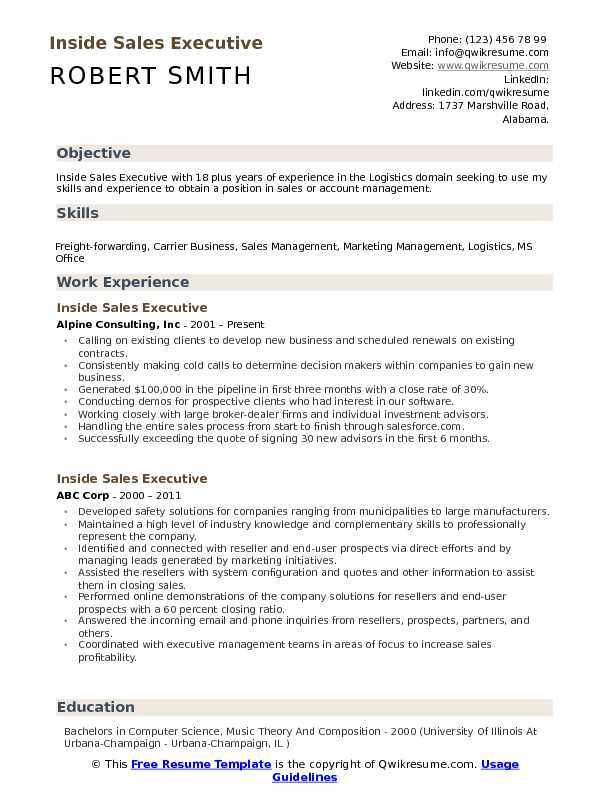 Summary : Inside Sales Executive with 18 plus years of experience in the Logistics domain seeking to use my skills and experience to obtain a position in sales or account management. Calling on existing clients to develop new business and scheduled renewals on existing contracts. Consistently making cold calls to determine decision makers within companies to gain new business. Generated $100,000 in the pipeline in first three months with a close rate of 30%. Conducting demos for prospective clients who had interest in our software. Working closely with large broker-dealer firms and individual investment advisors. Handling the entire sales process from start to finish through salesforce.com. Successfully exceeding the quote of signing 30 new advisors in the first 6 months. Extensive use of a CRM (Salesforce) provided by Brivo to enable management oversight and coordination of my activities. Contributing my ideas and energy to projects that will improve the effectiveness of the company. Summary : Inside Sales Executive II is seeking to obtain a position that utilizes my 16+ years of industry knowledge, customer relationship, organizational and process management skills to help grow and enhance the Sales and Operational divisions within the company. Primary internal point of contact for Emtec's top clients supporting over $30m in annual sales. Generating optimized quotes based on client standards, manufacturer incentives, and Emtec architectural guidelines. Managing, scheduling and coordinating order processes to minimize indirect order costs. Co-ordination of shipping dates to meet customer requirements and internal cost minimization guidelines. Tracking orders from origin to destination for key companies. Assisting the account representatives throughout the company with quote preparation and order placement for enterprise server and storage solutions for the manufacturers:. Researching major hardware and software product brand lines to keep the inside sales team current with product releases and changes in technology. Managing manufacturer special pricing and bid letters, keeping expiration dates and pricing current. Generating the weekly invoiced, open order and back-logged sales reports for numerous account representatives. Summary : Goal oriented experienced Inside Sales Executive I with 11 years of experience in the Finance domain, disciplined in business development and strategies with significant experience in the following areas: Territory Management Distribution Management Team Leadership Business Planning, Strategy Development. 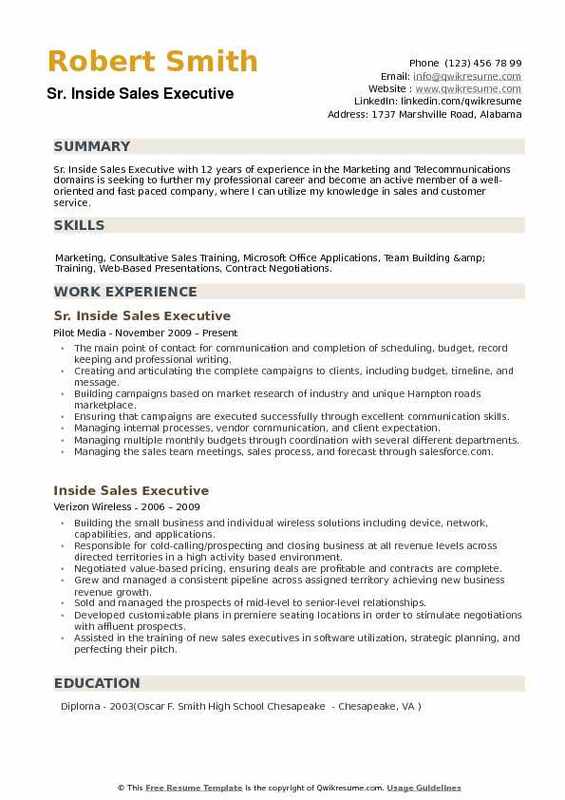 Skills : Outstanding Closing, Suggestive Selling, Consultative Selling, Customer Service, Customer Satisfaction Strong Leadership Abilities; Excellent Communication Accomplished In Microsoft Office. Managing a 25 million dollar book of business with 82% retention in all markets and increased profitable growth 6% year over year. Executing industry-leading sales strategies and tactical plans that provide for profitable growth. Owned and led the business development process within territory assignment. Successfully demonstrating the ability to build highly effective sales relationships with clients and other business groups to identify and initiate multiple product solutions. Active involvement in removing obstacles that interfere with effectively serving customer needs. In-depth knowledge of specific industry characteristics such as market trends, competitor products, and agency marketing techniques. Collaborated within a team to develop and implement a working SharePoint site for the sales organization. Leading team production meetings to demonstrate sales success to leadership. Objective : Junior Inside Sales Executive with 4 years of experience is seeking to pursue a career with a company that is client focused and committed to delivering highly valued products and solutions to a wide array of clientele. 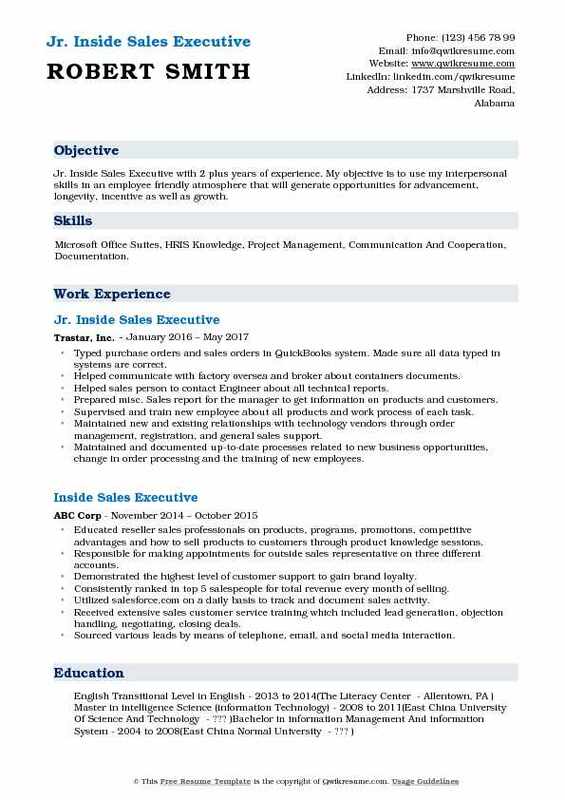 Sales executive covering West U.S and other key accounts in the eastern region. Maintaining and growing current Cerner relationships while driving new business laterally with said clients. Developing strong internal relationships at Cerner was key to hitting quota numbers year over year. 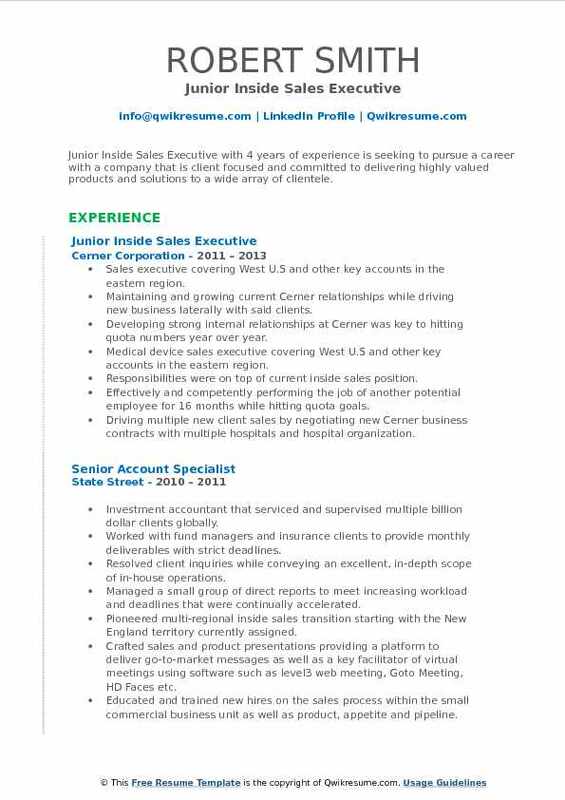 Medical device sales executive covering West U.S and other key accounts in the eastern region. Responsibilities were on top of current inside sales position. Effectively and competently performing the job of another potential employee for 16 months while hitting quota goals. Driving multiple new client sales by negotiating new Cerner business contracts with multiple hospitals and hospital organization. Working closely with Cerner legal and hospital organizations legal department to set new contract parameters and agreements. An active member of the national sales executive council generating and implementing tactics and strategies for stronger execution of organizational goals. Summary : Inside Sales Executive with 11 plus years of experience in the Technology seeking a position that will benefit from my sales and management experience, positive interaction skills and excellent customer service background. I am confident that my extensive years of sales experience will improve existing company revenue and generate new opportunities for company growth. Increased certified pre-owned revenue year over year by at least 10%, while exceeding all sales goals and quotas. Built, developed and closed deals ranging from 5m to 20m quarterly for the IBM certified pre-owned equipment channel. Managed and worked closely with IBM brand teams, telesales teams, and web sales teams to develop sourced opportunities into revenue. Served as an ambassador for the overall brand sales mission across all IBM sales teams, to ensure that featured products are considered whenever appropriate. Executed outbound campaigns to develop an interest in global asset recovery services, including all used equipment offerings. Supported IBM global asset recovery team through the administration and support of certified pre-owned equipment. Worked with various IBM internal groups to establish and managed social media sites in order to increase revenue. Sold pre-owned equipment to clients and track orders through IBM systems and vendors. Managed customer service issues through negotiation, collaboration and the administration of IBM processes. Objective : Jr. 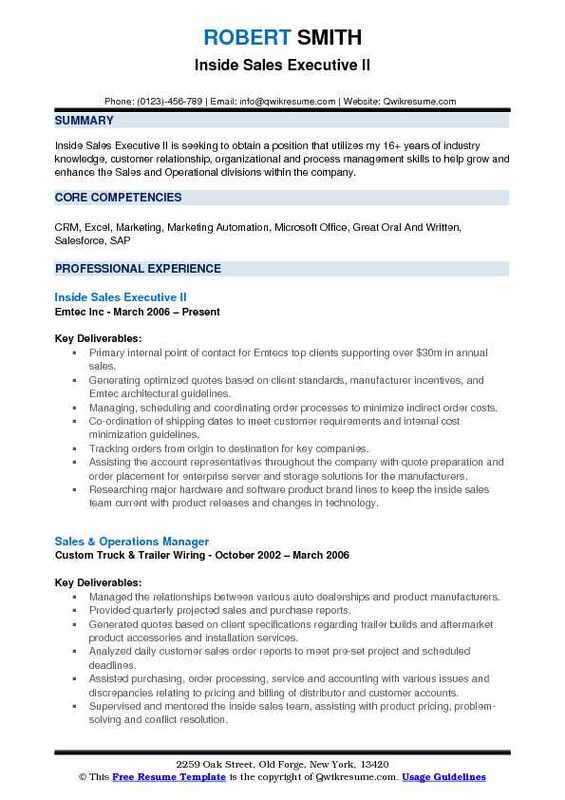 Inside Sales Executive with 2 plus years of experience. My objective is to use my interpersonal skills in an employee friendly atmosphere that will generate opportunities for advancement, longevity, incentive as well as growth. 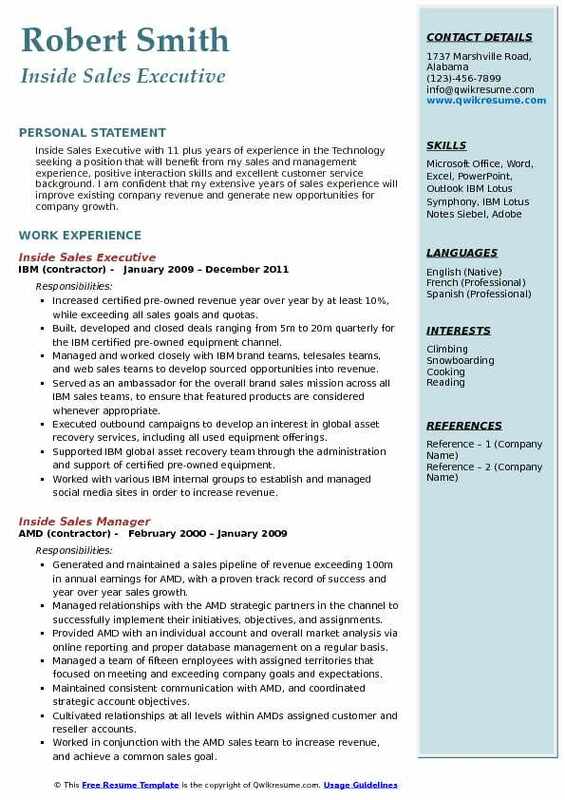 Skills : Microsoft Office Suites, HRIS Knowledge, Project Management, Communication And Cooperation, Documentation. Typed purchase orders and sales orders in QuickBooks system. Made sure all data typed in systems are correct. Helped communicate with factory oversea and broker about containers documents. Helped sales person to contact Engineer about all technical reports. Prepared misc. Sales report for the manager to get information on products and customers. Supervised and train new employee about all products and work process of each task. Maintained new and existing relationships with technology vendors through order management, registration, and general sales support. Maintained and documented up-to-date processes related to new business opportunities, change in order processing and the training of new employees. Facilitated the engagement with executive level and mid-level information technology contracts at mid-market end user accounts. Summary : A top producing and motivated customer facing Inside Sales Executive II with over 15 years of experience with strong technical, analytical and revenue generating skills. Wide-ranging skillset developed from experience at large Fortune 500 company as well as start-up Private Equity Fund. Natural team leader actively seeks feedback for continuous improvement and growth, and always looking for ways to improve the business. Sold the organizations products and/or services to established customers or new prospects via the telephone. Effectively sourced recent sales opportunities through sales lead follow-up and outbound calls and emails. Handled entire inside sales process from proposal to close while working to reach or exceed sales quotas. Maintained contact with current and prospect accounts and researched accounts and identified key players. Maintained a territory base of over 200 accounts with increasing sales by 10% 2016 over 2015. Filed customer record, assessed customer needs and requirement and closed profitable deals. Maintained and expanded the database of prospective clients while building a viable pipeline. Created spreadsheets, presented findings, and closed sales and achieve quotas. Extensively researched prospective clients for the field sales executives. Summary : Inside Sales Executive with 9 years of experience in the Technology domain with an ability to develop and expand relationships with clients and work effectively with other teams to maximize overall success. Able to prioritize activities and manage multiple job functions as well as analyze and draw conclusions based on data and clearly communicate the results through professional presentations. Responsible for aggressively developing and closing new business opportunities within the northeast in an outbound sales environment. Forged strong relationships with marketing, field sales, and product management to increase the development of territories through cross-group collaboration. Developing and delivering presentations with C - level executives and advertising agencies. Providing closed-loop feedback to marketing and sales management regarding the impact of campaigns. Analyzing the data and proactively offered suggestions to improve marketing campaign performance. Generating leads, initiating cold calls to prospective customers, followed up, performing pre-sales activities and closed transactions. Exceeded quota by 27% in 2010 resulting in over $50,000 in recurring monthly revenue. Achieved the Presidents Club Top Performer award, consistently meeting assigned sales goals each quarter of tenure and won several monthly top performer awards. Documenting and managing the activities and pipeline utilizing internal CRM system. Summary : Inside Sales Executive IV with 28+ years of in-depth Medical Healthcare experience in sales, marketing, staffing, public relations and management. Expertise in new and key account acquisition, new territory development and management, contract negotiation, and customer service. Solid background in Sales and Marketing with a great deal of knowledge in the areas of implementing marketing programs and sales tools. Consistently exceed all sales goals in my territory. 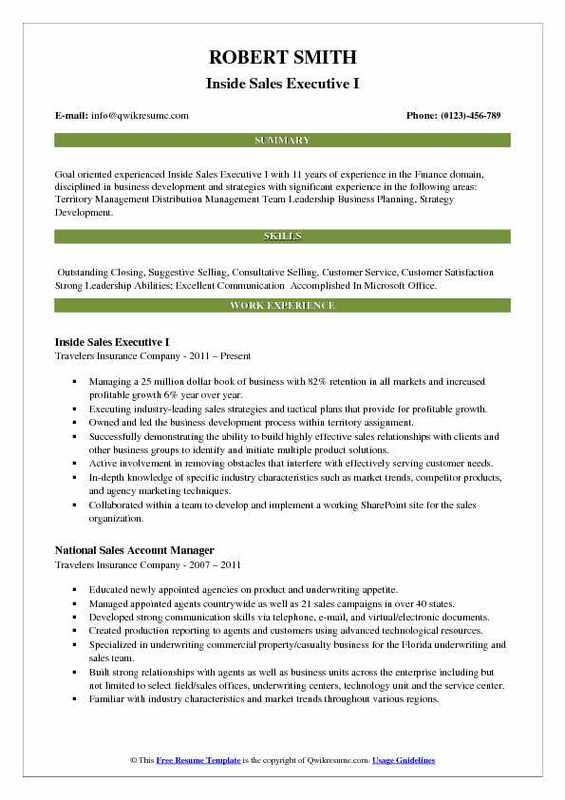 Skills : Product Solutions, Sales Revenue, Profit Growth, Staff Management. 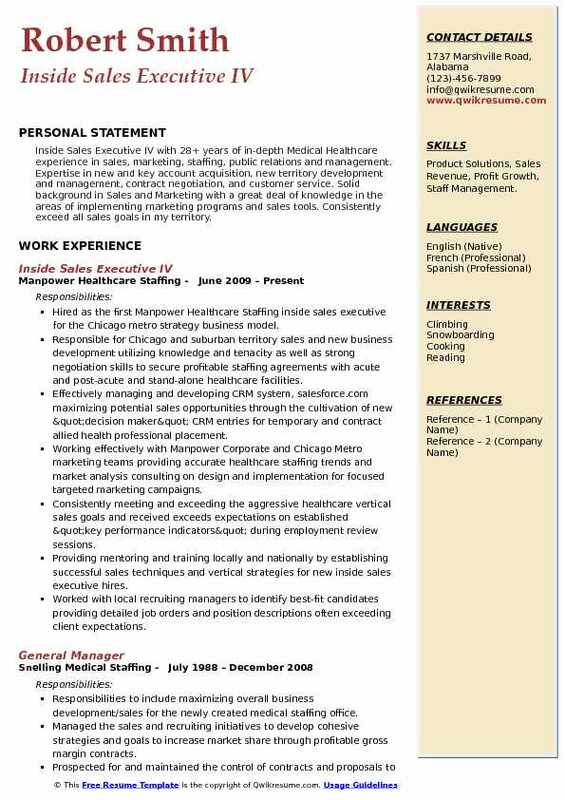 Hired as the first Manpower Healthcare Staffing inside sales executive for the Chicago metro strategy business model. Responsible for Chicago and suburban territory sales and new business development utilizing knowledge and tenacity as well as strong negotiation skills to secure profitable staffing agreements with acute and post-acute and stand-alone healthcare facilities. Effectively managing and developing CRM system, salesforce.com maximizing potential sales opportunities through the cultivation of new "decision maker" CRM entries for temporary and contract allied health professional placement. Working effectively with Manpower Corporate and Chicago Metro marketing teams providing accurate healthcare staffing trends and market analysis consulting on design and implementation for focused targeted marketing campaigns. Consistently meeting and exceeding the aggressive healthcare vertical sales goals and received exceeds expectations on established "key performance indicators" during employment review sessions. Providing mentoring and training locally and nationally by establishing successful sales techniques and vertical strategies for new inside sales executive hires. Worked with local recruiting managers to identify best-fit candidates providing detailed job orders and position descriptions often exceeding client expectations. Summary : Sr. 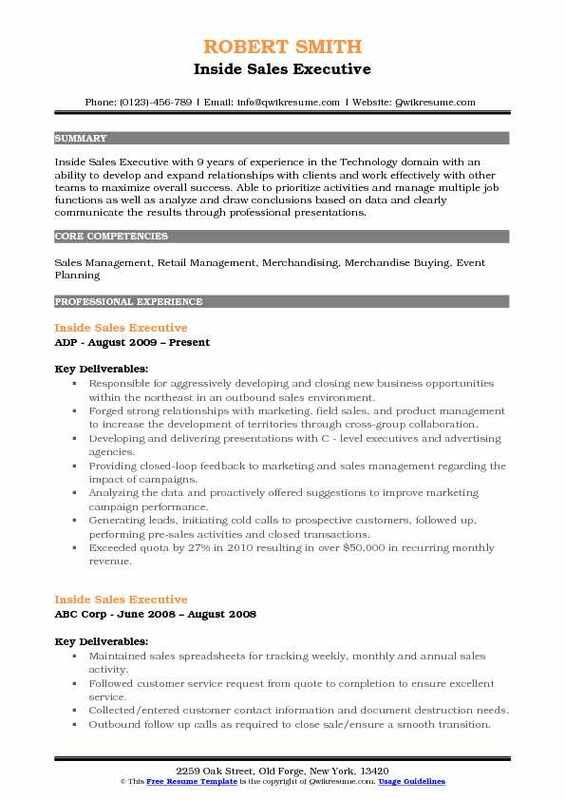 Inside Sales Executive with 12 years of experience in the Marketing and Telecommunications domains is seeking to further my professional career and become an active member of a well-oriented and fast paced company, where I can utilize my knowledge in sales and customer service. Skills : Marketing, Consultative Sales Training, Microsoft Office Applications, Team Building & Training, Web-Based Presentations, Contract Negotiations. The main point of contact for communication and completion of scheduling, budget, record keeping and professional writing. Creating and articulating the complete campaigns to clients, including budget, timeline, and message. Building campaigns based on market research of industry and unique Hampton roads marketplace. Ensuring that campaigns are executed successfully through excellent communication skills. Managing internal processes, vendor communication, and client expectation. Managing multiple monthly budgets through coordination with several different departments. Managing the sales team meetings, sales process, and forecast through salesforce.com. Using social sales strategies with LinkedIn, Sales Navigator, and Twitter to drive brand recognition. Making many daily calls to a variety of business industries and decision makers in the U.S.
Making the local business clients more successful with very effective online advertising.